The soccer equivalent of quarterbacks, these are the boys that reap the glory and suffer the humiliation depending on the score at the final whistle. Here are the top ten forwards from the Premier League. A fantastic opener against Manchester City proved that Murray was not on the way out. The 31 year old thought his career was all but over when he was shipped out to Reading on loan under Mr Warnock. However, with Alan Pardew taking over Crystal Palace he was soon back in the first team squad and raring to go. 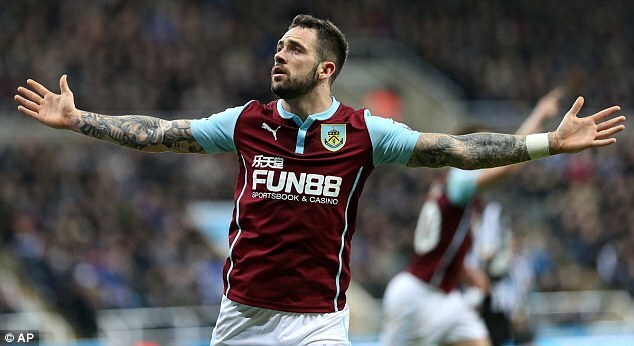 Liverpool and several other high profile clubs are after the services of this lad as Burnley are now waiting for relegation in the coming weeks. Brendan Rogers has beaten the other managers and is on the verge of signing the star striker who’s efforts alone could not save Burnley from going down. Olivier Giroud has had a cracking season with Arsene Wenger praising the French forward for “Unleashing his inner Diego Costa”. His ability and ferocity have increased along with his goal tally that currently stands at 18. He has been instrumental in Arsenal’s awakening mid-season propelling them to the top four places in the table. Van Gaal made some questionable choices this season. One was placing his star forward in midfield which had a direct influence on his performance. People watching could sense he felt out of synch in his new position and thus his form dipped. Thank god that Louis saw the error of his ways and placed him back in his centre forward spot resulting in him knocking goals in left right and centre again. The forward has netted 15 goals during his first season for the Saints. He scored twice in the fixture against Tottenham a few weeks back and becomes extremely dangerous when he is on form. As his confidence grows so does his ability with Graziano recently being described by team mates as “unplayable” due to his display of skill. The savior of Aston Villa some may say. Netting 10 goals within 25 games this season has seen the Belgian forward garner interest from a variety of clubs. Tim Sheerwood is reluctant to sell him and for good reason. Apart from scoring the winner against Liverpool propelling them to the FA cup final, he also is in terrific form after having a slow start to the season. What a breakthrough season the Tottenham Striker is having. Netting himself 30 goals across all competitions at only 21 years of age, the future certainly looks bright for Harry. Maricio Pochettino has seen the forward grow in strength as Tottenham reel in the disappointment from several summer transfer failures. Hardly suprising that an England call up came calling. Following a mid season dip, Alexis Sanchez has shown increasing levels on energy to rack up his goal tally to 22 and 11 assists. He is also enjoying an amazing rapport with his fellow team mate Mark Ozil as they build themselves into a formibdable attack pair. Another star signing from Wenger. Diego’s goal ratio per game currently stands at 0.79 which is better than any other forward who has netted more than five goals this season. He is currently ranked third in terms of number of goals with 19 to his name. Shot Accuracy is given as 63.2 per cent. He is joint overall best across these categories along with QPR’s Charlie Austin. At 26 years old, Sergio still has plenty years ahead of him. City have gone on record to say they will ensure he remains at the club for the coming years as they look to build a new team around his skill. Recently he scored his 101st goal for City in just 159 games.